At the end of the year we reflect on the previous year and on our practice. There are many ways that we can all do this. For some it will be quietly considering what we have appreciated and what we hope to continue in the coming year. Others will take some time to evaluate the year and make plans about how they’ll conduct their life in 2019. Regardless, as cycles come to an end, it is human nature to contemplate how we are affected or how we have made an impact on the events in which we were involved. For Aikidoka, we should recognize that the natural cycles of the year are greater than ourselves and, although we may play a role, it’s most important that we are present and alive as we move along our path. From a certain perspective this is applying the S.O.F.A. approach, that we discuss in class, to life more broadly – Show up, Observe, Focus, and Accept the outcomes. Approaching life from this perspective doesn’t require a plan or a strategy. Instead it requires a quiet confidence in our own resilience and a willingness to open our hearts and minds to whatever comes next. These characteristics emerge as we become more disciplined and expand our awareness to new levels. Moreover, they are the very things we develop and hone through our Aikido practice. We have enjoyed another wonderful year practicing together, and may we continue this journey together in 2019! The first beginner class of each month Aikido Olympia instructors begin with some talking about what Aikido is and typically take a moment to describe the kanji of Ai, Ki, and Do as a way of living in harmony with the energy of the universe. These classes are fascinating in that you can attend them almost every month for years and learn something new each time. When we talk about energy in a physical sense, we are also talking about its relationship with both power and work. Reviewing high school physics class, the basic idea is that energy is contained in all sorts of things (even the atoms of nitrogen in the air surrounding us) and when that energy is applied to making something happen, it can be considered power. In our training we discuss energy as the material we use to do our arts, the same way a painter might use paint or a potter might use clay. And we typically use the energy with our partners to make something happen like a kokynage or ikkyo (to do work). 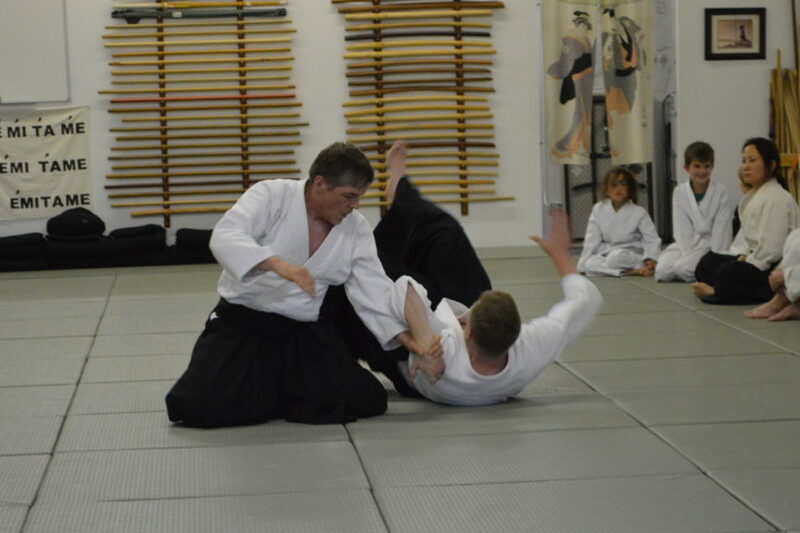 So, from a certain perspective, Aikido practice has a focus on recognizing and working with power. Power is a such an interesting topic- especially when we think about it from an interpersonal perspective. Many of us often look at power as though it has some moral value. In many cases we view it as a negative thing, something that others use to force us to do things. In many cases, we look at power as something that certain people have and that those people use to achieve their goal. However, if we consider that our practice is to help us live in harmony with the energy of the universe, that energy is contained in everything, and that the application of that energy is referred to as power, than living an Aikido lifestyle requires us to accept that everyone (everything) has power and to respect everyone’s application of their power. Once we can truly embrace power (whether it’s physical power, the charismatic power of a certain person, the reward power of an employer, perhaps the coercive power of yonkyo, or the expert power of an instructor) then we can constructively work with it and apply our practice to all of the relationships in our lives. Aikidoka should consider the relationship between energy and power when we think about the nature of our practice and when we consider how Aikido can be applied to our daily lives. At the end of last month, some of the instructors were talking about practice. This conversation started with the question – what is your practice? At a high level, most Aikidoka would answer that their practice is doing Aikido. This is a pretty good answer and covers considerable breadth. However, the question was directed at a group of people who clearly practice Aikido regularly and was intended to elicit a more granular response. In fact, many of the people who train at Aikido Olympia have a set of personal practices that help them along their personal journey. Some people sit zazen each week, others participate in misogi, some have more solitary practices where they mediate each day or perhaps recite the Aikido Yuishinkai motto every day. Regardless of the activity, the important part is that they are intentional and regular. It’s through this regular and deliberate activity that we develop our discipline and self-mastery. As we advance in our martial arts training, it becomes increasingly important to nurture a practice that helps us continually move toward self mastery. As O Sensei has been quoted, “true victory is victory over one’s self.” And, it’s through this process that we begin to take our Aikido practice from inside the dojo into our daily lives. In the kids’ class, we read stories about martial arts principles. Although these stories focus on many concepts, several highlight the importance of awareness in the lives of martial artists. Developing awareness is a clear goal of martial arts training, but it’s also an abstract and somewhat elusive idea for many of us. Concretely, what are we supposed to be more aware of? In Aikido practice, we are working at becoming more aware in several areas. First, awareness of the needs of those around us. Second, our practice helps us become more aware of the connections and rhythms that exist in the world. And, we are building self-awareness and an ability to continually improve our self-awareness.